Cupping is a technique that can improve your health and provide great benefits. It is an effective remedy commonly used in Traditional Chinese Medicine. It is best to do cupping with the help of another person. Combine cupping with acupuncture into one treatment, though it could also be used alone. Cupping involves applying glass cups on the skin, creating a vacuum, and pulling up the tissue in an affected area by suctioning out the air. This way, the underlying tissue is sucked, or raised, partway into the cup. 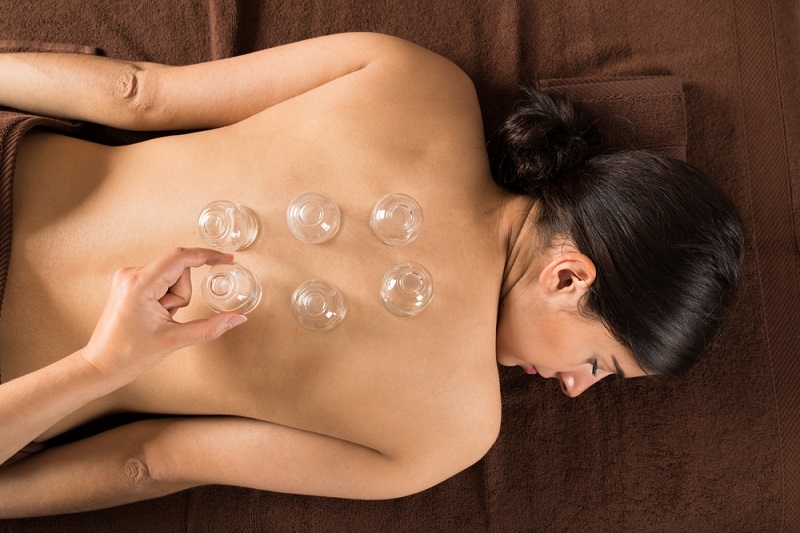 When the cupping technique is used in the proper way, and on the correct areas of the body, the healing process can be induced. While it is best to use special glass cups, you can also use your ordinary glass cups. Just make sure you wash them thoroughly. Use the smaller 60 ml (2 oz) glass cups for areas with bony joints and the larger 125 ml (4 oz) cups for broader areas with more flesh. There are also air cupping kits to invest in. Clean your skin with water and soap, and dry well. You can also apply oil to the skin to prevent irritation and make it easier to reposition and move the cups during treatment. Use long medical tweezers to soak a sterile cotton ball in rubbing alcohol. Drain any excess rubbing alcohol. The cotton ball does not have to be dripping wet. Using a candle or lighter, carefully light the cotton on fire. Be careful and keep all the flammable materials away from you. Insert the burning cotton ball into the glass cup and keep it there for 4 seconds. Once the cup is warm, remove the burning cotton and quickly apply the cup to your skin. Apply one glass at a time to avoid problems. Be sure to extinguish the fire. Leave the cups until your skin beneath them starts turning from red to violet, for around 10 minutes. Remove the cups by lifting them off with the hands. Do not keep them on for up to 15 minutes. The skin discoloration can last from a couple of days to a few weeks, but it is rarely painful. The purpose of cupping is to improve circulation, eliminate ‘heat,’ reduce pain, and pull out the toxins from your body’s tissues. There are four types of cupping to use, namely dry cupping, massage cupping, wet cupping, and vacuum cupping. It is highly recommended that a professional therapist does cupping. Cupping can result in some bruising, which is relatively painless. If the marks will not fade after a week or you will experience pain, consult your doctor as soon as possible. You can do cupping every day, but for no more than 15 minutes and for no more than 10 days. Many famous people use the cupping therapy, including Olympic athletes like Michael Phelps and celebrities such as Gwyneth Paltrow, Jennifer Aniston, Lady Gaga, Jessica Simpson, and Victoria Beckham. Are you going to join them? Have you ever tried a cupping therapy?